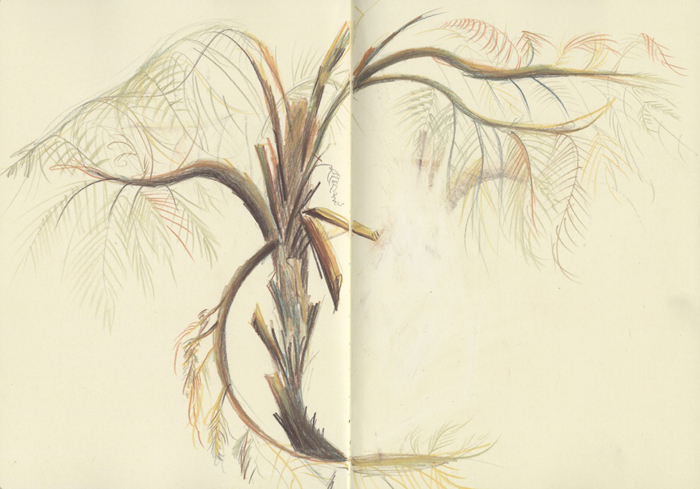 The year twenty fourteen is drawing to a close and before the final curtain call we thought we’d catch up with our authors for a little hello; chat about their books and see what they have in their sketchbooks (sneeeaky). First up isJesse Hodgson. Jesse is a bristol based illustrator and author of the wonderful children’s picture book Pongo. Pongois a beautiful tale and one that we go back to again and again, both to marvel over Jesse’s illustration style, which is simply a joy, and to revel in the warmth of her narrative. Here, folks, is Jesse Hodgson. 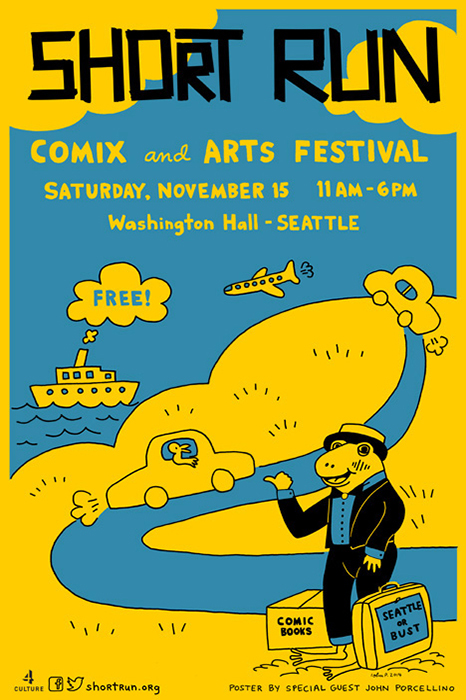 Nobrow is packing it up and heading out to Seattle, home of the wonderful Short Run Festival. Going on its fourth year, Short Run is a fun festival celebrating comics and art in the Pacific Northwest and around the world. Your friends at Nobrow fall squarely in the “around the world” category, so of course we’re bringing our beautiful books from our internationally renowned artists! We’ll also have our newest releases like Roman Muradov’s beautiful and mysterious (In a Sense) Lost and Found, Corinne Maier and Anne Simon’s essential Marx, and Dustin Harbin’s tremendous Behold! The Dinosaurs!, plus an appearance from our friend Jamie Coe, who will be flying in from London to sign copies of his new book, the excellent Art Schooled! We’re also excited about Jamie being named Short Run Festival’s special UK guest this year, and we hope you’ll join us at the festival, where he’ll be signing his books and selling an exclusive limited edition screen print, and again on November 20th, where he’ll be making a presentation at the Seattle Public Library’s Capitol Hill branch. A lot of big things are in the works for Jamie, so don’t miss your chance to meet the man behind one of our favorite new comics! If all of that sounds good to you, then we’ll see you at Table B10 in Washington Hall in Seattle on November 15th for the festival, and again at the Capitol Hill Library on the 20th for Jamie’s presentation! We can’t wait! We won’t! In fact we’re just going to head out to Seattle right now to get a head start! See you there! We’re back for another year of comic madness at this year’s Thought Bubble in Leeds. It’s going to be a whirlwind weekend with plenty to keep the eyes pre-occupied as exhibitors pile into the gargantuan venue to flog the best of this year’s harvest. 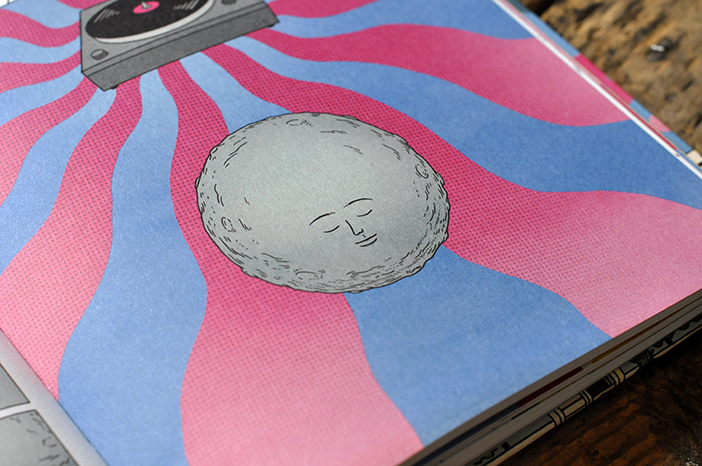 Joining us this year is author and illustrator Andrew Rae whose new graphic novel, Moonhead and the Music Machine has hit the streets with a resounding bang! He’ll be with us throughout the weekend to sign his book and just have a general chit chat. 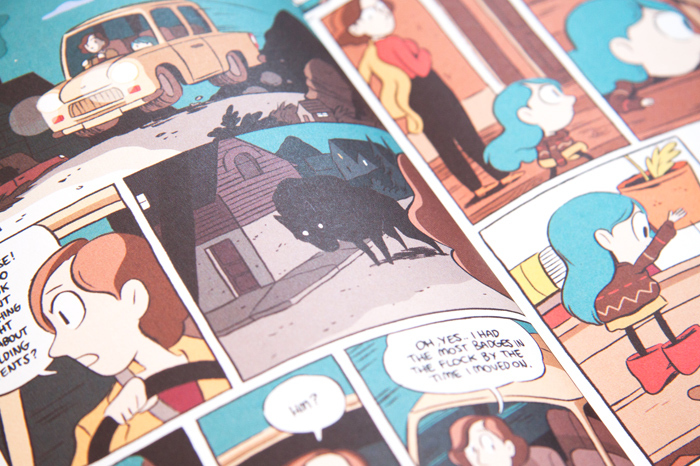 Also joining us for the weekend will be the creator of the Hildafolk series, Luke Pearson. Luke has been shortlisted in the Young People’s Comic category for the British Comic Awards which will be announced at Thought Bubble. We’re super thrilled with the nomination and have been keeping all manner of body parts crossed for weeks, so whether it’s unwinding with a Pearson win or simply unwinding, hope you’ll join us in shaking ourselves lose at stand 166-167 in the New Dock Hall. 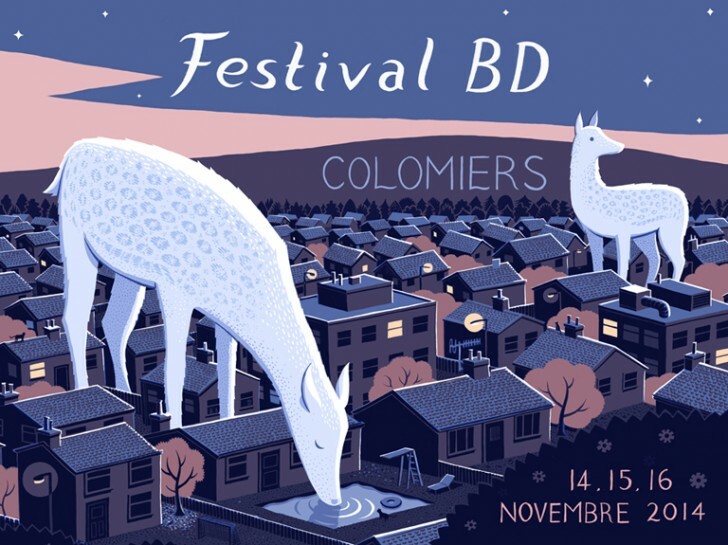 We’re back at Colomiers Festival de BD in France this weekend with a hoard of books for you to pore over and delight in. Last year the festival organisers invited Jon McNaught and Robert Hunter to create a bespoke exhibition to accompany the stand, this year Jon has not only been asked to create the festival poster but has also been invited to display blown up pieces of his work on billboards around the city. Billboards with a neon backdrop beaming out images of sleepy british towns, which also feature beaming neon billboards, but of the next best shampoo to hit the high streets. The mind reels! And nestled within this mêlée of fluorescent billboard lovin’ will be the festival itself where we’re setting up shop with the one and only Nicolas André. Nicolas André, master of colour and print, technician of form and space. Nicolas André who will be jetting down from Belgium from his exhibition titled the Heresy of the Muse (L’hérésie de l’égérie). Nicolas André, creator of Beyond the Surface. Nicolas André who we are quite clearly enamoured with… See you there, folks. No Sleep Til (Comic Arts) Brooklyn! November is typically a time for chilly weather, but things are going to be heating up in Brooklyn! Nobrow is thrilled to be exhibiting at this year’s Comic Arts Brooklyn (or “CAB” for those who appreciate a good ‘breev), and we’re ready to fan the flames of one of the hottest shows on the East Coast with our latest titles and our modern classics. We’ll have amazing new books like Jamie Coe’s Art Schooled, Corinne Maier and Anne Simon’s Marx, and Dustin Harbin’s Behold! The Dinosaurs!, as well as a special appearance from our friend Roman Muradov, who’ll be signing copies of his latest, (In a Sense) Lost and Found. 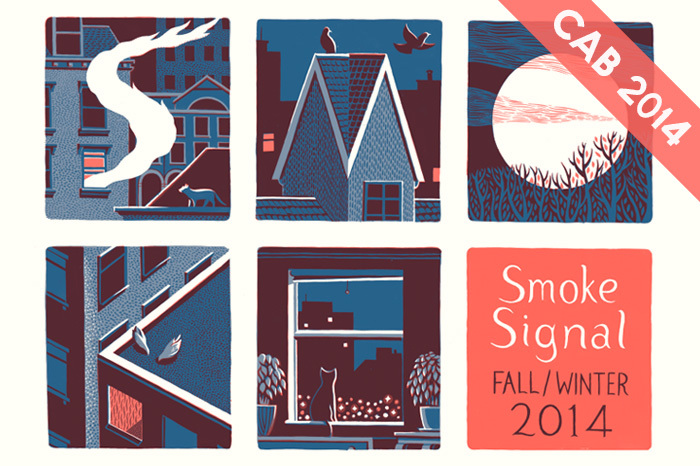 Nobrow’s also got a special treat for all those in attendance: a new issue of Desert Island’s popular Smoke Signal anthology edited by Alex Spiro, co-founder of Nobrow! The new issue features work from great Nobrow artists like Jon McNaught, Luke Pearson, Bianca Bagnarelli, Jamie Coe, Jesse Moynihan, Ben Newman, and many others, plus a collaboration featuring living legends Gary Panter and Charles Burns as well as comics from some of our other favorite cartoonists. Even better, it won’t cost you a cent! All copies of Smoke Signal are FREE for attendees, so make sure to pick one up at the door to get you started! It’s going to be a great show and a lot of fun, so be sure to head over to Our Lady of Mt. Carmel Church in Williamsburg on Saturday, November 8th to get in on the excitement with your friends at Nobrow!